@TheHenryMoore Shame to let one in at the end but what a statement win! Top of the league! @blueballoo100 The only thing that worries me about Ronan Curtis is that he might share the fate of another young Irish genius at #Pompey - Mark Kelly, whose career was undoubtedly cut short in part by being booted 6 feet in the air 10 times per match. 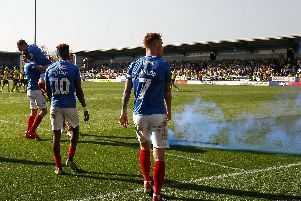 @Walkthe9T2 #pompey setting the bar and looking like a top 6 side at the very least. An incredible result only matched by Sunderland losing to Burton. Yikes!